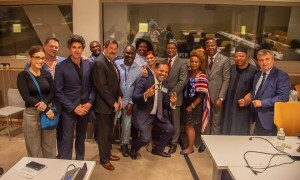 The Institute of The Noahide Code at the United Nations has been especially active in 2018 throughout New York, Washington, and The United Nations. In a special meeting on the 38th floor of The United Nations Headquarters, Rabbi Yakov D. Cohen, Founder and Executive Director of the Institute, met personally with the Secretary General of the United Nations, Mr. Antonio Guterres. The meeting was arranged to fall on Shushan Purim, after a historic and first time Megillah reading and Purim party at the UN Headquarters. The Megillah attracted a myriad of UN employees, diplomats and members of the media, as well as those working for UNICEF, who attended to listen to the story of Cyrus’s family set in the land known as current day Iran. The story of the Megillah takes place all over again throughout the world, wherever a Jew stands in the midst of all the other nations, and is constantly signaled out as such, and in the case of the United Nations, constantly diplomatically sanctioned. But the Megillah also offers the lesson that Rabbi Mordechai gathered children to pray, thereby getting parents and families involved in doing good and saving the world while saving his own people. That story, has resonance in the halls of the United Nations, where such emphasis is placed on the welfare of children, of families wrought apart by strife and war, and violence, where the hope resides in saving children, to save the world. As a foundation for the meeting with Secretary General Antonio Guterres, for Jews at the United Nations there was light, joy, overt happiness and honor. The Secretary General was extremely happy to meet with Rabbi Cohen, and acknowledged Rabbi Cohen’s efforts to shed light among those who transit through the UN. Both gentlemen spoke about the Isaiah Wall in front of the United Nations where it clearly states the time when people will ‘bet their swords into plowshares’. The Rebbe Rabbi Menachem M Schneerson referred in January of 1992 that the arms reduction agreement between the former USSR and the United States, particularly meant that Isaiah’s prophecy was coming to fruition. It was in that very site of Isaiah’s Wall, that for the first time, a Mehorah was lit during Chanukah. Illuminating the steps that connect First Avenue up to the leafy and beautiful NYC enclave known as Tudor City, the Menorah had as witnesses to its initial 2017 lighting, Ambassadors from Ukraine, Uruguay and the United States, as well as representatives from Azerbaijan, Canada and Slovakia, among others. For eight days, a beacon of light -and victory for the Jewish people- could be seen from any floor of the United Nations Headquarters. That there was sufficient oil to last eight days in the initial Chanukah story paralleled in 2017, that there was sufficient respect among the nations to value and to enjoy the light glowing from each additional lit lamp. An everlasting symbol of Judaism stood tall and erect in front of a huge building where 193 countries often convene, to discuss how to put an end to poverty, to put an end to war, to teach people to live in peace with one another, how to uphold peace and security. The Universal Noahide Code “UNC”, setting forth to the international diplomatic and religious community what philosopher Hugo Grotius cited as the basis for the 1945 United Nations Charter and thus, the cornerstone of all international law. Grotius further pointed out that the “UNC” is the practical means, by which humanity may strive to live in unity and in peace and can thus fulfill its potential to see all the families of the earth blessed. These laws of peace and unity encompass respect for G-d, for human life, respect for the family, for other people’s property, for the creation, respect for judicial systems plus respect for all creatures and the environment. A day does not go by that someone at the United Nations and its corridors, does not approach Rabbi Cohen first just to say hello. It is after all, not usual to see a Rabbi transiting through the building. From the initial encounter, the Rabbi hands over to the person a ‘good card’, which reflects the Universal Noahide Code. During a recent encounter, a man said after hearing what the Codes entail: ‘I could live by that’. Just as Jews were able to be redeemed from Egypt and to this day is an ongoing and dynamic process, humankind too, shows its need to leave the constraints of everyday life and society, and to be elevated spiritually, to know its Creator. The Noahide Codes do serve as a bridge to unite humanity, for peace and unity and love. There is no better place to evidence this, as the United Nations: a place which has a unique calling to beat their swords -and hate- into plowshares, transforming humanity into brotherhood, to a time when the whole world will only know Him.